For a food product to be a success in the marketplace it must be stable throughout its shelf-life. Quality deterioration due to chemical changes and alterations in condition due to physical instability are not always recognised, yet can be just as problematic as microbial spoilage. This book provides an authoritative review of key topics in this area. Chapters in part one focus on the chemical reactions which can negatively affect food quality, such as oxidative rancidity, and their measurement. Part two reviews quality deterioration associated with physical changes, such as moisture loss, gain and migration, crystallization and emulsion breakdown. Contributions in the following section outline the likely effects on different foods and beverages, including bakery products, fruit and vegetables, ready-to-eat meals and wine. 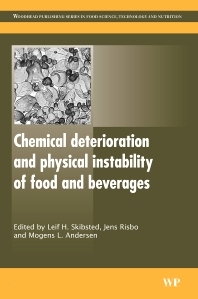 With contributions from leaders in their fields, Chemical deterioration and physical instability of food and beverages is an essential reference for R&D and QA staff in the food industry and researchers with an interested in this subject. Leif Skibsted is a Professor in the Department of Food Science at the University of Copenhagen, Denmark. Leif Skibsted is well known for his research into food quality deterioration and food oxidation in particular. Jens Risbo is Associate Professor in the Department of Food Science at the University of Copenhagen, Denmark. Jens Risbo is well known for his research into food quality deterioration and food oxidation in particular. Mogens Anderson is Associate Professor in the Department of Food Science at the University of Copenhagen, Denmark. Jens Risbo is well known for his research into food quality deterioration and food oxidation in particular.